-Wirefree padded bras and smooth front lining for slightly support and shaping. -Adjustable cross back straps and medium leg cut out for freedom of movement. 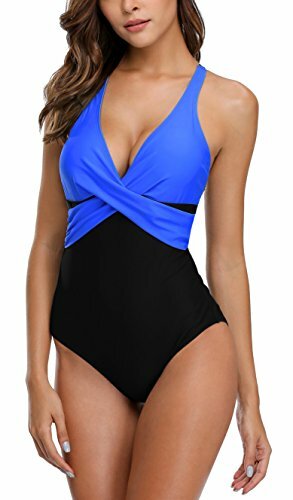 -One piece swimsuits with plunge V-neck and front twist cross, offer a flattering look. -Tummy control colorblock one piece swimwear, perfect for swimming, beach party and any waterside activities. -Do not bleach and iron. -Color differences allowed for light effects.